"Why do you want to video record me taking a dip shower?" What I am doing is Lost in Translation. This boy is enjoying his dip shower in a washbasin here in Ho, Ghana. If you are over 70 years old, from the USA, you may remember these days. There was a time when there was not running water in the home in the USA. My father did not have electricity in the farm homestead when he was a kid, maybe in 1940 in the USA. I am always hoping the world could get their mind around "time," the world has changed drastically in the last 50-100 years. Ghana is a walk back in time; West Africa uses many practical and effective techniques that were being used in the USA less than 50 years ago. In a way, we could evaluate all countries on a time continuum compared to the USA, and Ghana right now is about 1930-1940 in the USA, this is the time period of Ghana presently. A little girl standing in a bucket taking a dip shower in Elubo, Ghana. Why or how do I know this is a girl? Note, these hang in trees water showers are the most inefficient use of water for a shower possible. It is the stupid way to take a bath with limited amount of time and water, a dip shower is the effective and efficient way of cleaning, not a bag hanging in a tree. A shower in tree needs about 20 liter to work, maybe more, about 10 gallons, and the shut of valve never works properly. You can heat the water by putting the two liters of water in the sun on the roof, or you can heat with a one-cup electric coffee cooker. I seldom take cold showers when anywhere on the planet, I now take dip showers even when I have a shower, it is better in many ways. How to Take a Two Liter Bath? I will give this a bang; I still need the recorded video to prove it is possible. Nevertheless, I will be damned if I am going to video myself in pair of swimming trunks taking a dip shower. Now, pretend you are the little girl standing in the bucket like the photo above, or the little boy standing in the washbasins. 1. Two one-liter bottles of water. 4. Wash Rag - Note, I recommend the French Wash Rag or Washrag. 5. A cup, a small cup will use less water, or glass. Directions…. I need a model for a video; it would be easier to explain with a video. 2. Poor a small amount of water onto your head to wet your hair. 3. All the water used needs to drain into the bucket; this is the secret of conserving water. 4. Put the minimum amount of shampoo in your hand, and lather up your hair, making sure to not get any in your eyes, again, another secret, minimal amounts of soap. 5. Take the Frenchie Washrag and dip in the water, now lather with a bar of soap, you do not need much water to suds up your whole body. 6. Step out of washbasin, and wipe off all the extra soap by brushing off or shaking your body, you need the soap suds outside the water..
7. Wash your face now, and make sure you know where your dipper is located, because you are going to be blinded by the soap. 8. Reach for the dipper or cup, now standing straight up, drip the water on the top of your head, making sure the water goes down your whole body. If you do this slowly, and making sure to wipe away all the suds, you can rinse with extremely small amounts of water. If you truly want a one-liter shower, you can shake your head like a dog and truly get rid of all the soap. A towel would absorb a lot of the soap if you wanted, then rinse with even less water. Contrary to any backpacking forums, and never really done it advice you have learned, this two-liter thing is almost never needed. There is water in 99 percent of the locations on the planet, anywhere there is people, there must be water, and we cannot live without it. When to use this two-liter Bath? Therefore, you will learn, these principals apply mostly when you are in some little hotel in India, and the owner boils you a pot of water for a bath and puts outside your door. Or you are in Kilgoris, Kenya and the hot water is outside your door. Alternatively, you are in Tibet, and for some truly insane reason the owner of the hotel brings you two thermos bottles to shower, because Chinese people do not shower. There are places on the planet where the locals seldom shower, they just wash their faces in the morning and take maybe one good bath per week. In East Africa at 1300 meters above sea level, the boys only wash their faces daily, they smell. I call this the "Frenchie Wash Rag," I am not sure where it came from, but I will blame in the French Colonizers in West Africa. I think they left this washrag system and baguettes and have now divorced themselves from West Africa. I wrote about the Frenchie Washrag first in newsletter 203 in October 1, 2006 in Natitingou Benin. 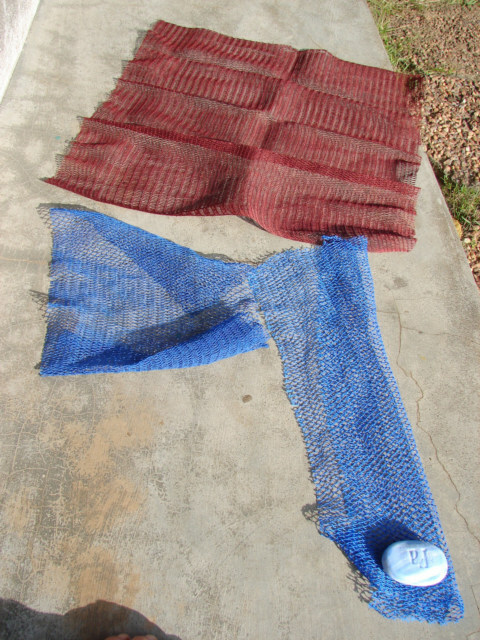 This is truly a wonderful washing system, I presently am carrying about one yard in length piece of plastic netting, the thing is mildly abrasive, I can use it to wash my back by pulling back and forth, it truly gets my back and body 10-50 times cleaner than a normal wash rag used in the USA. If you want to remove dead skin cells, this is the best possible wash rag on the planet. As I understand, dry is more sanitary than wet. The rubbery plastic Frenchie things dry super fast, while any normal rag takes hours. Not using a rag or anything is an option, but there is value in opening the pours once or twice a week with a good scrub. Yes, a person should not use these rubbery nets to a level where they take too much off, but this is what is nice, I clean my body fast. If I am in a common shower where it truly is not comfortable, I can get debris off my body faster. I have noticed, in the tropics, when you walk around as much as I do, as I sweat, the dust accumulates on my body. I need to clean my body better because of this dust. The inside of my computer collect this same dust, I need to clean the inside of the computer also or it will overheat. Now, if you stay in air conditioned room with a window AC, it could maybe clean the air, but Africa is a dust bowl. I do not like the AC that recirculate the same air. The amount of dust pollutants is triple of the USA, and Asia is normally about double, in Asia the polluted air or smoke from cars is bad. Central and South America can sometimes be the cleanest on the planet. I am aware of dust and sound pollutants, the ambient noise and the amount of dust entering the air are factors or variable of my health and happiness. I am not going to start walking around with a mask on as some of the silly-need-to-go-home bunch do, but I am not going to just ignore it. I cough up a good spit in the morning, it is natural, I do this because it is natural and clean my noise passages with a good blow, because again this is natural. To not spit or blow out our noses is a huge problem of modern man. I do this spitting, coughing and clearing my nose in private, contrary to the natural man who does this anywhere and everywhere. My failing is not disinfecting my room better, but I am sort of macho, I will drink out the same coffee cup for a week. If my piece of bread falls on the floor, I am not going to starve, or worry about germs. I am a very healthy person, there are many people who are horribly sick all the time, mostly because they think they are healthy, but truly have malnutrition. Modern countries have a lot of malnutrition problems. My macho tendancy to ignore all this crap is causing me problems as my body gets older it is not defending itself, and I must optimize my bodies chance of survival. I am 77 years old and live in the USA. When I was a child I always took a bath in a big tub that my mother used to wash clothes once a week on a Saturday night. She put buckets of water on the stove to heat and we all took a bath. Some families used the water for more than one person but in our family we each had our own clean water. We sometimes saved rain water for this purpose. Later I moved to a home that only had a shower and I brought the old washtub in for my grandson's nightly bath. One night I decided he used the shower at home and the wash tub was no longer necessary. He became very vocal wanted his tin can for a bath. This summer we all are going to be issued rain barrels to save the rain. We will only use it to water our plants, wash down the house etc. Most of Africa uses toilet paper regularly, however, I have yet to truly decide what the do in the bush. But in a hotel, it is standard, and it is sold everywhere. There is always the mystery, what did that person do before me? I went into a common toilet the other day after a boy, once in I discovered there was no paper. I went back to my room, and retrieved some, but the boy, he did something or nothing. I suspect that only about 25 percent of the men wear underwear, but again who know, I do not see them hanging on the line to dry. Nobody should ever try to understand India or Southeast Asia on the toilet situation, truly is disgusting.